Discussion in 'Geese' started by pete55, May 9, 2011. There's been a few members on the Geese Section recently that have experienced problems with air cells, particularly in shipped eggs. Problems appear to include; detached air cells, ruptured air cells and abnormally positioned air cells located on the side of the egg instead of the blunt end. It appears that the purpose of the air cell is to provide a pocket of air for the almost mature chick to breath. Separated by a thin membrane it can be breached easily by the chick's beak and allows the chick to establish pulmonary respiration as the chorio-allantoic membrane begins to fail. So the location and size of the aircell is of critical importance to facilitate the hatching process. Of course there are exceptions, for instance breech where the chick HAS to externally pip in order to establish breathing. Sometimes nature finds a way but the mortality rate of malpositioned chicks is higher. After shipping, the eggs may have been thrown about all over and subject to repeated jarring and jolts - no wonder air cells detach despite careful packaging! These eggs require individual and careful management if they are to sucessfully hatch. Firstly check they are not contaminated with egg contents from other broken eggs and if necessary wash using a proprietary egg disinfectant. Then candle the eggs and assess the level of damage. 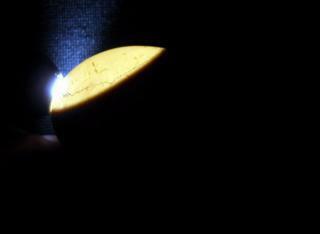 Candling may reveal hairline cracks and air cell damage. Sometime even free small bubbles of air are visible and fluid moves freely into the air cell space. These eggs should be coded with pencil and then stored upright in a cool room for 24 hours. This period allows the egg contents to settle and encourages any free air bubbles (which may be minute) to settle at the top of the egg where the air cell should be located. These eggs should then be set into the incubator in a vertical position and not turned for 36-48 hours, after that turning by tilting side to side at a 45 degree angle helps to keep the air at the top. Otherwise leave well alone and dont remove for weighing. During the second week the chorio-allantoic membrane (generously supplied with blood vessels) grows out from the chick to line the complete inner surface, including the air cell. Think of it as inflating a balloon within an already inflated balloon. The air cell is now resealed and from 15 days can be treated normally though gentle handling is needed. In some cases eggs are laid with the air cells in the wrong position and have to be managed slightly differently to compensate for this. Usually the most common mal-position of the air cell is on the side of the egg and often this defect is not noticed until first candling. This is why I prefer to candle all my eggs for closer inspection BEFORE commencing incubation. In the case of an air cell on the side of the egg I incubate with the egg positioned at a 45 degree angle. By doing this Im using gravity to keep the heavier egg contents to the bottom and hope the air cell expands a little towards the blunt end. The changes are small but may help when it comes to internal pipping. From Day 21 I incubate the egg in a position with the air cell uppermost though still raised at the blunt end at a 45 degree angle. The egg is auto-turned side to side but the mid position is always with the air cell upwards. By stopping full 180 degree turning early and setting in this position it maximises the chances for the chick to settle into a normal hatching position. In these cases when the time for drawdown of the air cell occurs the air cell appears to take up almost two thirds of that side of the egg. However the aircell is closer to the chicks beak in it's hatching position and it stands a fair chance of being able to internally pip normally. A Toulouse egg with an abnormal air cell located towards the side of the egg. At Internal Pipping the air cell takes up almost two-thirds of the top surface of the egg. However the chick has managed to pierce the membrane with its beak and establish breathing. The cross is the original centrepoint of the air cell and the pencil outlines show its change in size during incubation. chickenpal147, Phillisy, AshleySGM and 11 others like this. Thanks Pete! Great start to another awesome thread! The incubation techniques described for management of an abnormal air cell worked. The air cell expanded well and the egg achieved the target weight loss of 16%. On hatching the air cell had enlarged so it was in a position from just near the top of the egg to almost two thirds down one side. The gosling was able to internally and externally pip normally though was lying at a slightly oblique angle in the egg. The chick started rotation approx' 48 hours after internal pipping. After rotating across the egg for about an inch progress stopped (probably due to the oblique position). The egg was checked for remaining blood vessels before slowly removing the upper third of the shell. The chick was moistened around the edge of the shell using a Q-tip soaked in sterile saline and then kicked its way out of the shell normally. This is a good sized and healthy gosling. 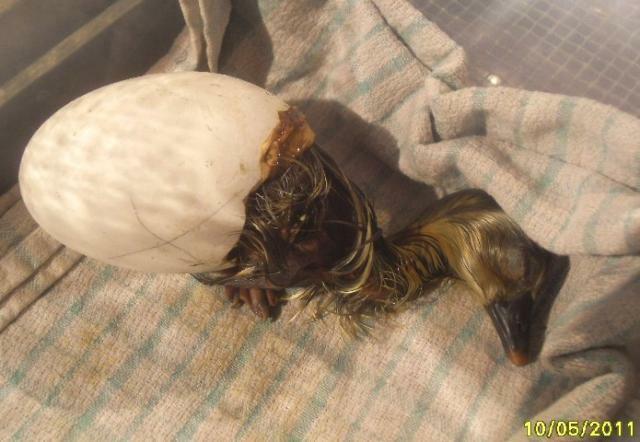 The abnormality was in the shell structure NOT the gosling. This demonstrates the value of adapting incubation techniques and assisting such goslings as they can be healthy birds. Interestingly this was the only egg the female laid with an abnormal air cell. With a small amount of assistance in the rotation phase the gosling hatches normally. AshleySGM, KathryninQuebec, SiriusChicken and 1 other person like this. For the sake of future readers I will tell my aircell/shipped eggs woes before update. I received 4 utility toulouse eggs in the mail, box looked great, eggs looked great. I weighed and marked them, but forgot to candle for loose aircells. SO put them in the bator for 24 with no turning. After 24 began to rock them, then after another 24 hours remembered I had not candled them. This revealed the loose air cells. I followed advice of those on these threads and put them in bator upright with no turning. Original advice was until day 5-6. Yesterday evening was day 6, so I candled again and aircells seemed much more stable, still a little "wiggly" but not "floppy" or "sloppy". 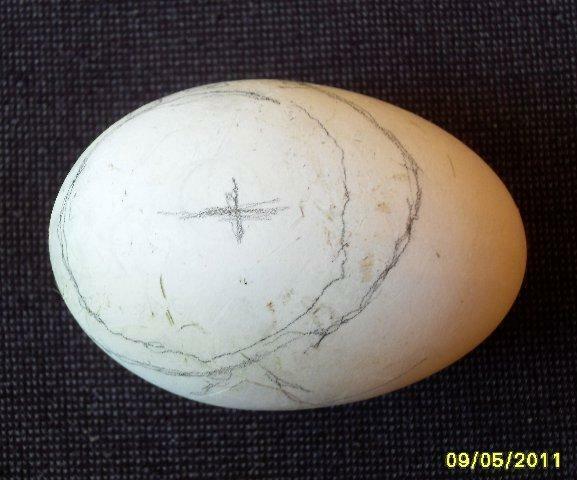 I was also able to see veining in the second egg. SO now 2 with for sure development, Other two I still cant see veining, but eggs are darker and in all appearances look the same as the other two, ie the shadow of the yolk, etc. They were just a bit dirty so not as translucent as the other 2. Pete I just love how informative your threads on incubation are. I am incubating some shipped turkey eggs for a friend and candled the eggs before placing them in the incubator. Out of twelve eggs, two have detached air cells. I see where you recommend keeping the eggs upright at a 45 degree angle and turning them in this position (but not for the first two days or so). How do you keep your eggs at that angle? I was thinking of cutting a paper egg carton and setting those two eggs in there at an angle. But I'm not sure. Could this thread be "stickied" for future reference? Pete, I'm sure everyone here has already said it but you're AWESOME and amazing! I wish you could put all your knowledge on a chip and I could just upload it into my head. I never thought about how all this works and like most everyone on the planet took for granted the miracle of the egg, how it's laid and how it gets here and turns into a little chick/gosling/peep/etc. Having never even thought I'd own an incubator, I've now got 3 remaining leftovers in there praying something happens. The aircell is so important and your information makes all the things we see through candling (which is the easy part) make sense and know what we're looking at. Have you though of putting all your photos/documentation/knowledge into a book? "The Amazing Egg". I read your profile and just noticed you already had! LOL. I vote yes on the stickey for Pete's info. Yes, I fully agree with the above. This is extremely useful information. I ordered 3 more eggs off of Ebay this week, from yet another vendor. They came yesterday, and the seller actually shipped them express mail, and paid $2 more in postage than I paid in total on the auction. They were packaged extremely well. The air cells are a total mess -- essentially non-existent at this point. I've come to the conclusion that shipping goose eggs is the most fraught with peril of shipping any eggs, with the possible exception of emu, rhea, or ostrich. I never had issues with detached air cells on shipped quail or turkey eggs, and packaging is NOT the issue, because a couple of my goose egg shipments that were packaged superbly actually had worse air cell detachment than the two from the vendor that just threw them into the box with some crumpled paper. I believe that it is the size of the egg and physics that is responsible. I remember that kinetic energy is related to size and mass -- for example, and adult and a child half his height falling and hitting their heads have a big difference in the force -- the adult twice the height hits his head on the pavement with five times the force. I believe that is what is in play with goose eggs during shipping. Just too much jostling around. I'm going to do as Pete suggests - they are resting now upright in a cool place. I didn't open them up until early this morning, so I'll let them rest until tomorrow morning before I put them in the incubator. At this point, if any of them make it, ok, but if not, not the biggest loss. I ordered them the other day because when the one gosling died and the other eggs success looked iffy. But, at this time, I have 3 healthy goslings, and I'm now positive after finding more threads and photos that #3 is a male. So, if they hatch, I'll be grateful, but if not, I won't cry about it.